Whilst teacup pincushion have taken a backseat until I start selling some, my devil’s playthings have been eager to find something to take their place. Enter Crafty Cats. 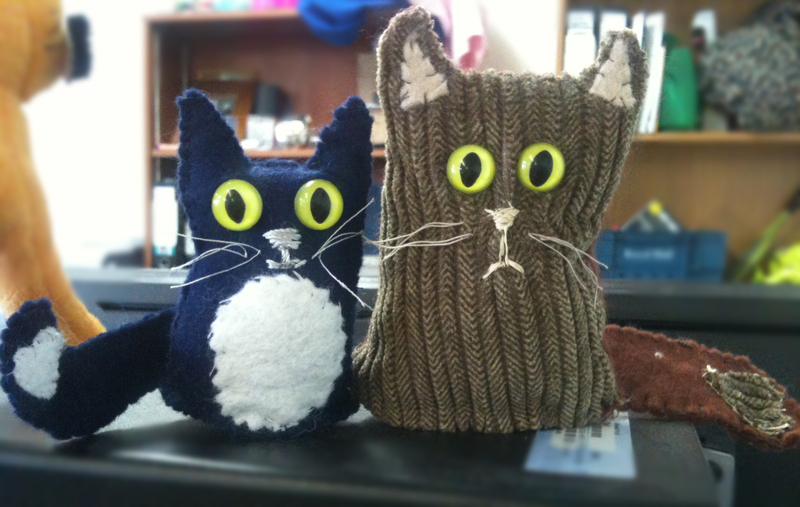 I started making Baloo (mog right) completely by accident one day, whilst messing around with scraps of an old jacket and remembered that I had bought some cat eyes for another project. I agree. he looks miserable, but don’t we all know cats like that? The type that gaze up at you like they haven’t been fed all week, but you slipped them a piece of cheese 20 minutes ago? Lol was my second and she was made as a gift for Paul. She is adorable and they sit between our computers at work. 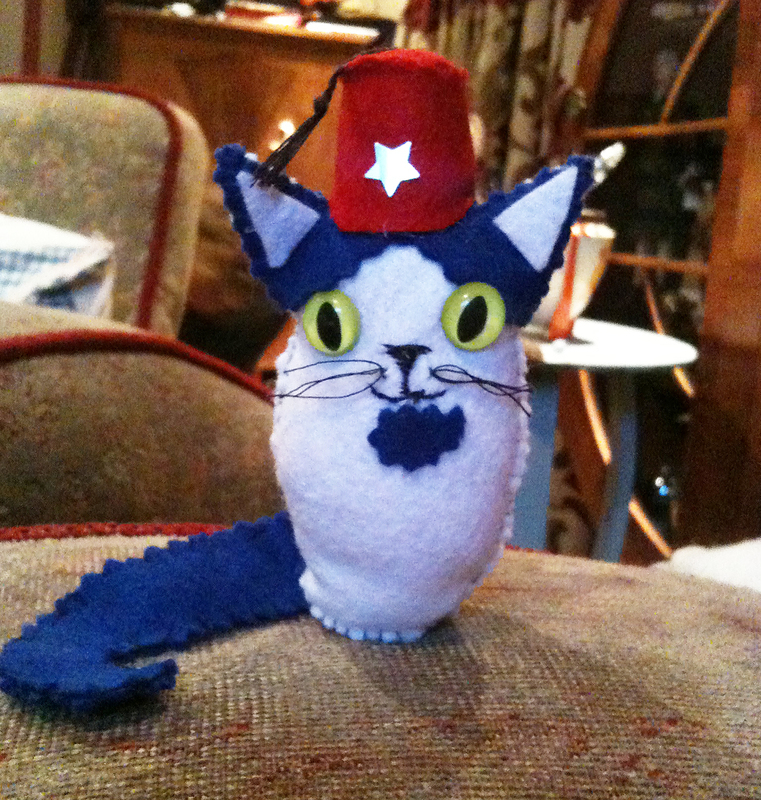 Fez Cat for Lee, made by me! Posted in Arts and Crafts, Day to Day and tagged arts and crafts, cats, crafts, felt crafts, kitten von mew, kittens, make do and mend, pinup girls, vintage girls. Bookmark the permalink. It has been quite a while since I last wrote on my blog…well, a while for me considering the verbal waterfall that usually sploshed it’s way over these pages. This year has somewhat crept up on me. I knew it was coming; it happened to warn me of its existence thanks to a 2012 page at the back of my diary, so I should have known really. I am excited, daunted, refreshed and cynical all at the same time. I cannot wait for our wedding and honeymoon, the planning of which has helped me through some very tough times, but then you get the financial worries that rear their ugly heads, even with budget weddings such as ours. In fact, the wedding isn’t the issue, it is the honeymoon! After such a financial struggle all year and cutting corners on wedding expenses with ‘make do and mend’ creative thinking, we wanted to be able to let our hair down on a honeymoon that we felt we deserved. All great on paper, but when the phone number you thought was on the bottom of the invoice is in fact the price of your holiday, it starts to dawn on you that even the best laid plans and saving as much as we can each month may just lead to a long weekend in Bognor Regis. I have also managed to fill up every weekend in May with performance bookings and considering we are getting married on the 2nd June, I should have possibly left more time for decorating the venue and organising! Other excitements for the year…Well there is The Berliner of course, which along with the Halloween version will be a great highlight of this year. 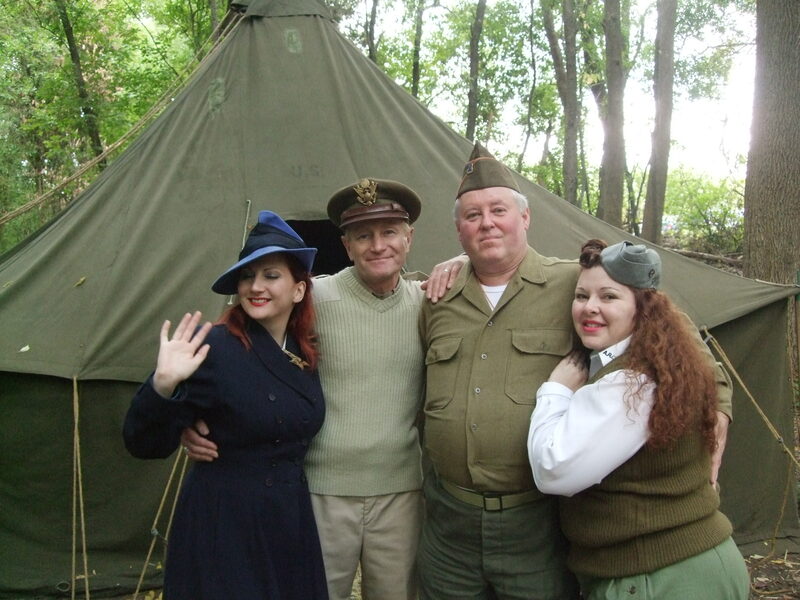 Who can imagine singing 1940’s songs on a military steam train to Berlin, followed by a performance for the mayor and press and a visit to WWII bunkers? Of course my dear, faithful War and Peace Show is in July and I have an idea of a new little act I may do there this year. I can’t wait to catch up with friends and see what new dioramas the groups have come up with this year. My local Wartime in the Vale weekender will be my 1st event as a married woman AND my Birthday on the Saturday! I am hoping to catch up with local wedding guests as well as enjoy performing at this lovely event! The glamour of Goodwood Revival calls once more in September as I get to squeeze the near life out of my 2 fabulous girls Sue and Milly and wave at famous racing drivers like I know them. This year I will NOT overuse my voice and end up with Laryngitis again! 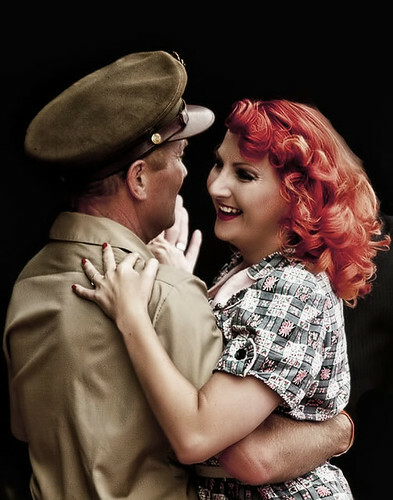 Posted in Day to Day, Events and Performances and tagged burlesque, events, goodwood revival, honeymoons, kitten von mew, money, pinup, the berliner, train of events, twinwood, vintage girls, war and peace show, weddings. Bookmark the permalink.